Frozen prawns are a chef’s delight. Buy frozen prawns and treat your family to a fresh, safe, and tasty meal. Don’t bother with prawns that have been defrosted prior to purchase. They just don’t compare in terms of freshness. Four points to keep in mind when preparing frozen prawns are selection, defrosting, cleaning and recipes. Selection: Always buy your frozen prawns from a reputable retailer with a high turnover of product. If you plan to make a hot dish be sure to purchase raw (versus pre-cooked) prawns. 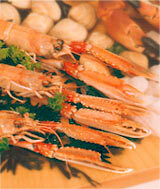 The pre-cooked prawns tend to be dry if re-heated and they will not have the succulent flavor of raw prawns. Because of the dryness issue use of pre-cooked prawns is recommended only for use in shrimp cocktails, sushi, salads, or other cold dishes. Because you will not be re-heating them for use in these dishes, dryness should not be a problem and the convenience usually outweighs any slight difference in flavor. Defrosting: Frozen prawns should be defrosted shortly before preparation. My usual method is to put the frozen prawns into a colander and rinse them with cold water. Gently turn them several times over five minutes while rinsing. They will be fully defrosted within five to ten minutes. Cleaning: Cleaning the prawns is an important step and should not be skipped if you wish to prepare a quality meal. Even if the packaging says that the prawns have been de-veined or cleaned, often there are traces of veins left on the prawns or only one side of prawn has been de-veined. Use a small, sharp knife and cut the prawn lengthwise both front and back. Use your fingers to remove the veins (normally black goo in the backside of the prawn and a blue stringy substance on the front side of the prawn). Depending on the recipe you are preparing you may choose to either remove the tails or serve the prawns with tails on. 1 lb. raw frozen prawns. Defrost and clean the prawns as directed above. Preheat oven to 425 degrees. Sprinkle the baguette with water and place in oven for 10 minutes to crisp. Peel head of garlic and slice each clove into thin pieces. Using a large cast iron skillet melt the butter over medium heat. Add the garlic and brown for 2-3 minutes. Add the prawns and cook for 2-3 minutes on each side. Grind black pepper onto the prawns while they are cooking and finish with 1/3 cup of Chardonnay. Remove the baguette from the oven, slice into 1/2 inch pieces and place in a covered bread-basket. Serve the scampi in the cast iron skillet (your guests will enjoy dipping the pieces of baguette into the delicioius buttery, garlicky, wine-flavored sauce). Serve with chilled Chardonnay and a Caesar salad.